Hive Inspection. 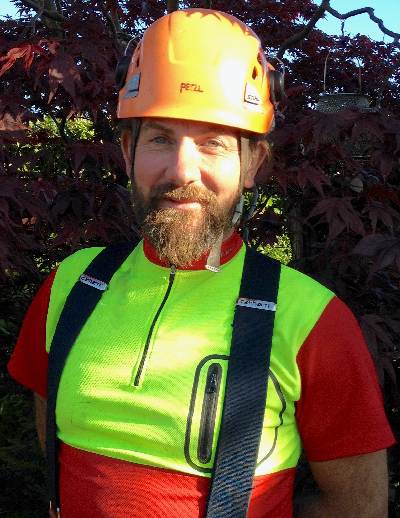 by a Pembrokeshire Tree Surgeon. Cleaning hive tools is vital to prevent contamination spreading, here Rachel (NBU) uses 10% domestic bleach (90% tap water) to remove bacteria before inspection begins. 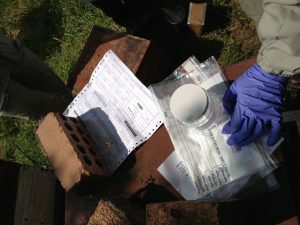 A cell has a broken seal and the inspector is removing its contents to be examined. The contents are placed inside a plastic beaker with a ball bearing inside. The contents are then pulverised with a right hand shake. A pipette then withdraws the contents of the beaker and places it in a dip on the test vessel. After 1 minute the blue lines tell if there is either AFB or EFB, two blue lines and the hives will be destroyed, 1 blue line and honey is on the toast. The white small chalk like pieces are brood/pupae that have been infected with Chalk brood (CB) whilst developing in the cell. CB is a fungal infection that kills the pupae. 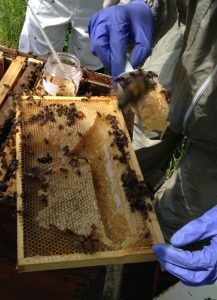 The super is removed so the brood body of the hive can be inspected. 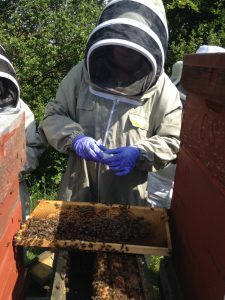 The nursery bees are mainly in the centre caring for the pupae and newly emerged ladies. This is a classic form of the frame of brood, the centre main structure of the frame is eggs, pupae (open cell) and the closed dark orange/brown are the sealed cells as the pupae metamorphosis to bees prior to hatching. 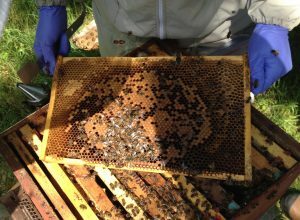 To the outside of the frame is more yellow like capping of the cells, this is honey and pollen stored directly to feed newly emerged bees. This is pupae that has been infected with Sacbrood (SB). See below for SB info. CB is spotted and removed, see tweezer in top of photo. 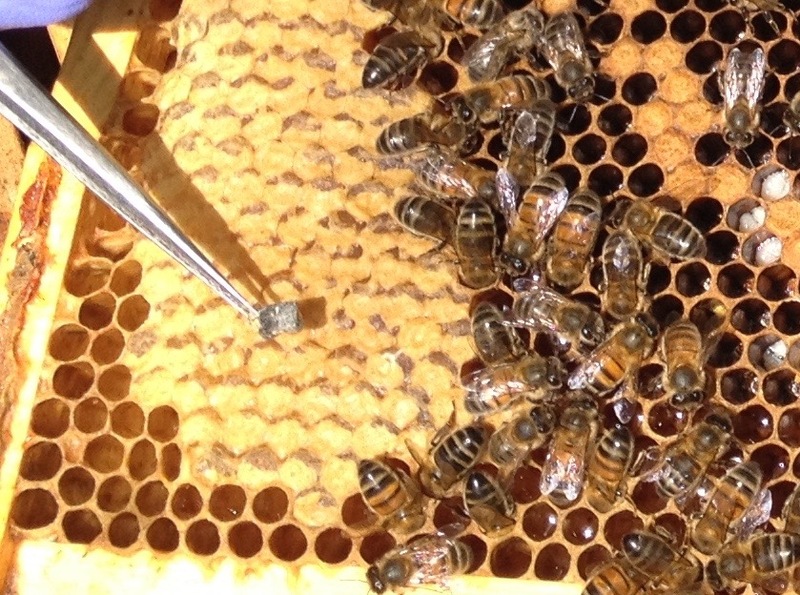 Also, the frame form with the brood in the centre and stores of honey to outside. See below for CB info. 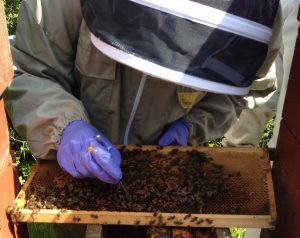 Honey is taken from the super frames, to be analysed for Foulbrood. Three scoops are placed in a jar. 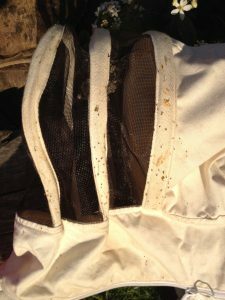 60+ Stings to the left of my bee suit vale and 5 stings to my shoulders (I only had a vest on my top half). After inspecting ten hives in four hours the bees got quite angry. There must have been some pheramone on my vale as the stings were localised to that area. 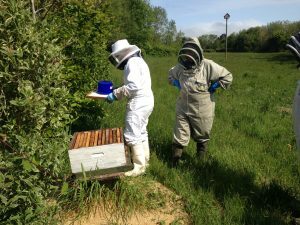 Thank you for looking at Arb-Aid’s Apiary, Back Garden Beekeeping by a Pembrokeshire Tree Surgeon. AFB is caused by spore forming bacterium called Paenibacillus larvae. Spores are the infective stage of the disease and infection begins when food contaminated with spores are fed to larvae by the nurse bees. EFB is caused by the bacterium Melissococcus plutonius. 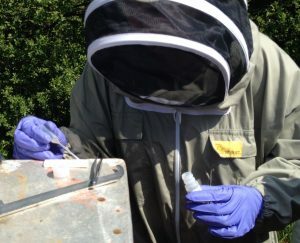 Larvae become infected by consuming contaminated food fed by the nurse bees. Unlike AFB, the remains of larvae that die from EFB do not rope when drawn out with a matchstick. All infected colonies are destroyed. 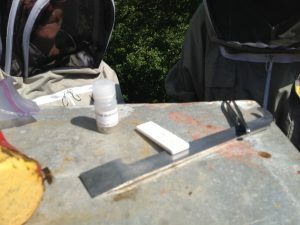 The first stage is to kill the adult bees by tipping a bit of petrol through the crown board. All combs and any zinc queen excluders from the colony(ies) are then destroyed by burning them in a pit. The rest of the hive(s) and any appliances are sterilised by scorching with a blow lamp or sterilising with appropriate chemicals. 1. 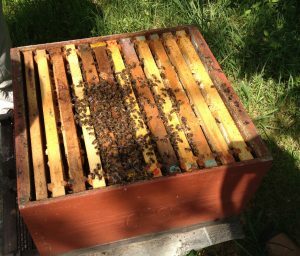 The colonies can be treated with the shook swarm husbandry method. See NBU website. 2. The colonies may be treated with the antibiotic oxytetracycline. 3. The colonies may be destroyed, as for AFB. 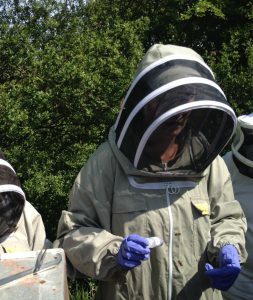 This will be carried out if the colony is too small for other treatment methods, is too heavily infected to respond to treatment, or at the beekeepers request. However, the range of options available will also depend upon the time of year that the disease is diagnosed and other factors such as the strength of the colony or the level of infection. Chalkbrood is caused by the fungus Ascosphaera apis which is ingested by the larvae where it then penetrates the gut wall to absorb nutrients. As the spores germinate and multiply, the larva eventualy dies of starvation. After a few days of growth, the larva and fungus swells and fills the brood cell where it will eventually harden after a few days to it’s distinctive ‘mummyfied’ appearance. Here it adopts a mottled white and black colour and each chalkbrood mummy will produce millions of infective spores which stick to the cells, hive components and adult bees. A. apis is highly infectious and can be easily spread between hives throughrobbing and drifting of drones and worker bees. 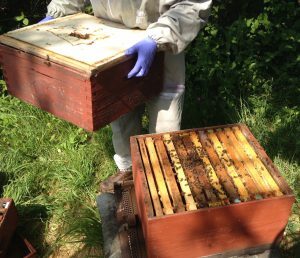 Spores can be transferred between apiaries on contaminated equipment and through the intervention of the beekeeper. Not a serious disease among strong healthy colonies. 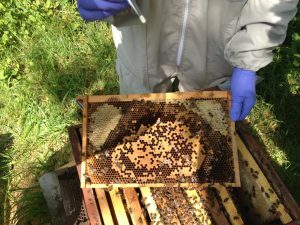 However, insmaller colonies or those under stress (for example suffering heavy varroa infestations) it can become a problem. For keeping chalkbrood to a minimum the maintenance of good strong stocks which appear better able to resist the fungus. 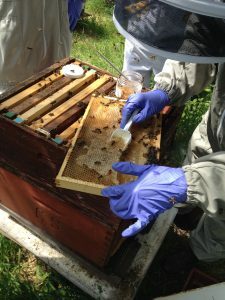 Hives which are suceptable can be re-queened. A viral infection of the brood caused by Iflavirus genus and occurs when a diseased larva fails to pupate after they have been sealed in its cell. Fluid then accumulates between the body of the larva and the unshed skin, forming a sac. 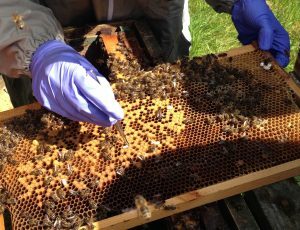 A relatively common disease during the first half of the brood-rearing season and can often exist unnoticed affecting only a small percentage of the brood and does not usually cause severe colony loss. 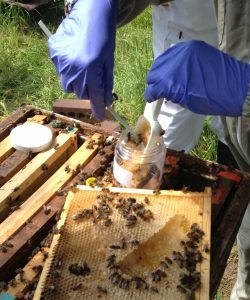 Can spread through the intervention of the beekeeping through the use of infected equipment and by transferring material from infected colonies to a healthy colony. 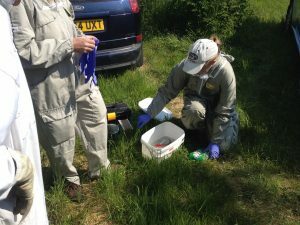 In addition, the virus can spread through the feeding behaviour of nurse bees and bees robbing infected colonies. Re-queening the colony can help to aleviate the symptoms of sacbrood.